In just 10 weeks, our nation will select a man or woman who will become the 45th president of the United States of America. Whomever we elect will take the helm of a nation that has grown increasingly hostile and intolerant of the very foundation and principles upon which it was so nobly founded—the Christian faith and Biblical values. Earlier this summer, I had the privilege of meeting with the Stormans family, devout Christians who own a local pharmacy in Olympia, Wash. The Stormanses refused to dispense a drug called Plan B that induces abortion. After a series of state and federal court battles, they filed a petition before the U.S. Supreme Court. It’s also crucial for us to examine the positions of candidates who are running for office on the state and local level. Check their stance on pivotal moral issues, and vote for those who best reflect Biblical values. We must be willing to do our homework on those men and women who represent us, and go out on Nov. 8 to do all we can to exercise our voting privilege. Remember: Nearly 30 million evangelicals failed to make their way to the voting booth in the last election cycle. We must not repeat that mistake again this November. 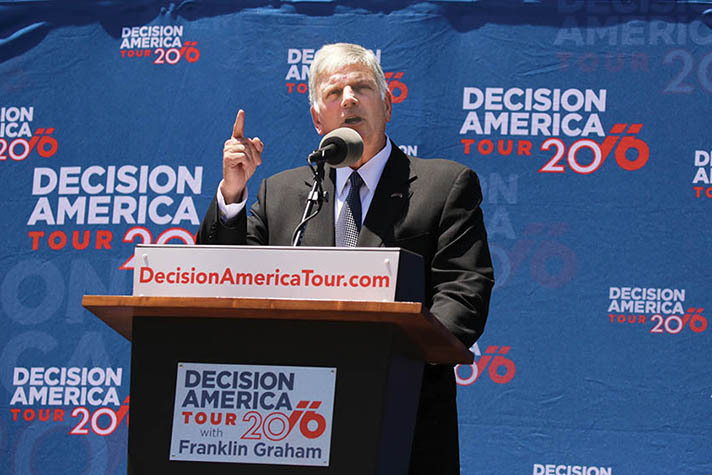 As I have visited state capitols for our Decision America Tour, beginning in Des Moines, Iowa, on Jan. 5 and ending in Raleigh, N.C., on Oct. 13, it has been clear that multitudes of Americans know our nation is in deep trouble. They have come by the thousands because they love their country and are willing to call on God in prayer.